The party is over, EGU 2019 is history. Over the days I have written some impressions I got from the conference, but sticked mostly to the positive points (Day 1, 2, 3, 4, 5). As always, the EGU itself, the opportunities it offers to talk to all kind of scientists and listen to their advancements was amazing. But compared to the last years the organizers have implemented several changes to the program, on which I would like to address a few honest comments. I am very aware that there are many people in the background who do a hell of a job to make this conference possible and they face the impossible task to make everybody happy and the challenge that every year more and more scientists want to attend the conference. Most of these topics came up in many many conversations during the days with other scientists, people are complaining every year (usually about the drinks and the rooms for certain sessions), but this year there were constant discussions about all sorts of complaints. In order to have enough time for the in parallel running poster sessions the number of talks was increased from 6 to 7 per session. A reason given was that more scientists want to have a talk rather than a poster and therefore there should be more space for talks. I personally have expected a worse impact by this change. Yes, surely, after six talks you are tired and do not listen anymore to the last one as you should, but as many do not follow the whole session anyway (see poster parallel to talks below), it seems to work. What I find more problematic is the notion that only because scientists prefer talks they should given more of them. First, this devalues posters and second, talks are up to now seen as something like an award for a good abstract and an interesting topic. Devaluing posters and talks at the same time is certainly not good, but as we have to see it as a business decision, it is acceptable. Especially as it has a reason behind it (more time for posters). When I found out about this change I was honestly deeply worried. I have made the argument in the past that this change will heavily impact early career researchers. With scheduling posters parallel to talks and a one-abstract rule (so killing the second poster option) the question comes up whether it is even worth to go to EGU next year (so basically AGU rules at EGU). The argument for this is two fold. On the one side the big shots will get a talk. Generally EGU is good in promoting young scientists to get talks at their conference. And with more talks available, it is hoped that the opportunities are not diminished for the ECR’s. I have no overview whether this has worked, but I give the benefit of the doubt. The other side is potentially much more damaging. In theory most senior scientists will now have only one abstract and most of them will end up in talks (I neglect at this points that most senior scientist are able to put fake first authors at the first place of the author list to have as many contributions as they want). That means, they will not have a poster where they are obliged to fulfill their attendance time. And it is the poster sessions where ECR’s have a chance to get in contact with the senior scientists, might it be to make their names known or make important steps for their career. By risking to loose these opportunities (see someone you are interested in a talk and then go to their poster to talk with them), ECR’s are in risk of loosing chances to progress. I understand that there are now too many scientists to give everybody a second contribution, but I am not really convinced by this argument. Because when you walked through the poster halls, many many lines in of poster boards where empty. So there is space for more posters. Might there be ways of change? Sure, but they might all be more complicate to implement (allow two contributions, with a first and a second, but the second is not guaranteed to be allowed to get through… but as many author lists are cheated it will be hard to implement as scientists will find ways around it). The biggest change was to put posters in parallel to talks. It is not uncommon to do this at conferences, AGU is famous for that. Nevertheless, I do not think that this is a good decision. There are massive consequences for the conference, not only for the posters, but for the talks as well. Compared to my last experiences at EGU I got the impression that more scientists leave the talks in between. This leads to disturbances, especially in the small rooms. As they are overfilled anyway, people leaving are ending in pushing and and asking for letting them through. Also posters are devalued by this. I was surprised that in the poster session I attended there was still proper crowd (and that at the end of the conferences), but in the end you have now to choose: see the headline science in a talk or much more of potentially non-headline stuff in a poster session. It might work when you are a disciplinary scientists (as I have written before, EGU is not really prepared for interdisciplinary visitors) as ideally there are just a few sessions you really care about and those are all coordinated that the poster sessions do not overlap the talk sessions. But honestly, this hardly ever is the case. As a consequence I have certainly missed out of many interesting discussions at the posters this year as well as many talks (usually ECR talks), which I had to skip because I still wanted to have the chance to see scientists at their posters. Networking is important. Anyway, the networking session was introduced to full the space for the poster session. And in my opinion, the introduction of the final hour in the evening has completely failed. At the first day you saw quite a lot of people in the poster halls talking and drinking, the typical catch up at the start of a conference. But the following day a huge amount of scientists used this hour to make an early end to the conference day and went to town for food. So basically the conference was shorten every day by an hour. I also missed the walk through the poster halls at the end of the day. Have a drink, go to sessions you potentially wouldn’t have had walked in on purpose and having nice chats with young and senior scientists. That is for myself (and many others I spoke) the most important part of a conference. This is gone at the EGU. Most scientists take down their poster either directly after their poster session in the morning/afternoon or at the beginning of the networking session. There is hardly anybody at their posters anymore and especially those you want to talk about are gone. In my opinion this has heavily damaged the usefulness of the conference. So at least make the network session another attendance time for the poster. Having one in the morning/afternoon and then another in the evening for everybody who preferred talks over the day would be proper way to minimize the impact. Yes, complaints at EGU are the usual, but having this many heard over the days in close to all conversation I had is not a good sign. And we are now not talking about the little thinks like drinks (you can never make that right) or room choices (they are always too busy in the small rooms and to empty in the big ones). And yes, there are some complaints I can fully understand on the minor topics (offering springs to not to use so many plastic bottles, but giving out the drinks in the evening in plastic bottles? Really?!) The topics mentioned above are much more damaging for the EGU and the experience the scientists take from it. It leads to devaluing posters, disturbances in the talks sessions, ECR’s only confronted with people who care about their topic and hardly anymore a wider audience, even more the feeling you have missed important research and opportunities, and the impression that that what many people valued so highly at the EGU is gone. While I do not expect that there will be a roll back of the changes for next year, there will be a bigger topic coming up for the future of the EGU, which I heard in so many conversations: Is Vienna still the right place for the EGU? We all love Vienna, not too expensive, a nice conference centre, good opportunities to live, eat and socialize during the conference. Nevertheless, EGU has outgrown the conference centre. The queues at the small rooms get longer and longer, many do not get in and then look for a second choice. In some sessions the number of people in the room where double the number of seats available. 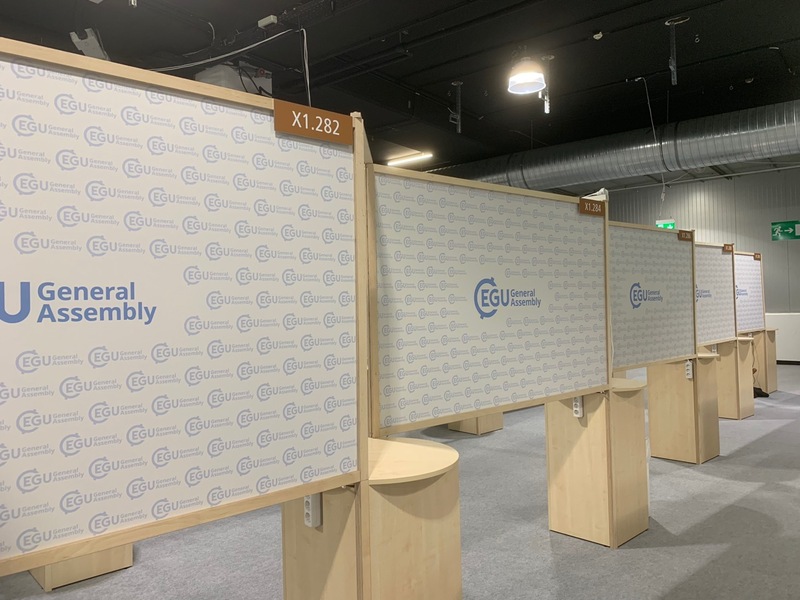 Together with the changes made this year and the consequences that even more scientists want to switch between sessions and posters, I do not see how Vienna can be the long-term choice of the EGU anymore. The alternative would be to actively limit the number of scientists attending, e.g. by rejecting abstracts. Honestly, nobody wants that, but the changes implemented this year haven’t made the conference experience better. The final day at EGU 2019 is done. It was an exciting day here in Vienna, which ended with my poster at the final poster session of the conference. But let’s start in the morning. After hanging up my poster I joined the Energy Meteorology session for a couple of talks. Next I went to the data assimilation and prediction session, which is a stark contrast to the the one before. While in the Energy session data assimilation will be explained in some nice pictures, the latter session is always highly theoretical and filled with a lot of equations. The second session of the day was for me happening at the dynamics of the atmospheric circulation session. It described well the influence of eddies on the atmospheric circulation and thermodynamics and showed the change of wind shear over time. In between I took a look at a talk about skewed ensembles, which gave me a lot to think about. After lunch break, which saw a bit of sun, but was at the same time quite chilly outside, I visited a PICO session on paleo-databases. PICO are still not really my favorite type of presentation, but with this topic it was quite alright and let to interesting themes and discussions. Again I interrupted the session to see another talk on Gaussian process regression. Final session was then the poster session. I showed a topic quite similar to last year. I was surprised that even for the late session I had some interesting discussions as usually these sessions are quite empty. With that the conference ended from my side. It was a successful one from my side of view as many discussions will hopefully open doors for future collaborations. Concerning the conference organisation today I will write another post in the upcoming days, as it will require an honest comment. Up to then, until next time in Vienna. The fourth day of the EGU 2019 was the day of seasonal prediction. To be more exact the session was named subseasonal to seasonal (S2S) and it covered a wide range of topics within this field. It started in the morning with a session on mechanisms and ranged from large scale atmospheric patterns to ocean variables. The second session focused on predictability and showed several examples of variables which are predictable from a few weeks to a few month in advance. In the final presentation session the topic switched to applications and showed some use of the prediction for the energy and agricultural sector. In this section I have also given a talk on multi-model subsampling. It was not really my talk, as I was just taking over from someone who was not able to make it to the conference this year on short notice. Anyway, it went quite alright. The day ended with the posters of this session, which offered a good mix for all of the topics above. Tomorrow I will have my own poster in the final session of the conference. The third day of the EGU this year saw a change in weather. Instead of the well loved sunny Vienna spring days, the next few days will show us their grey and rainy side. Anyway, it was also a day which was not so overwhelmingly filled with interesting talks, so I used it more for meeting people. It started in the morning with a splinter meeting on sea-level databases. A small group had a lively discussion on creating the future of databases in this field and it was fun to see what might happen here in the future. After that I had some talks with people on future projects and visited a few talks on ice sheets in Antarctica and Greenland. The rest of the day I mainly visited the poster halls and in between watched a medal lecture on astronomical cycles. As there was no session of real interest for me left for the last slot (and if it was, I guessed I wouldn’t have fit into the room anyway) I called it a early days end. An EGU day without sun is quite different than with it. Usually everybody leaves the centre for lunch to have a picnic in the park, but with all the rainy intervals, everybody looked for a place inside the conference centre. As this might be repeated for the rest of the days, the EGU this year will have a completely different character than the last ones I visited. Let’s hope for the best. Tomorrow will be my talk and it will be certainly dominated by seasonal prediction. Day two of EGU 2019 and as always it was a busy day. My program started today with a session on climate prediction. It was interesting to see different approaches to similar problems. Especially when you see in successive talks similar physical mechanisms described from different perspective, but explained completely differently. A chat between some authors would then certainly bring solutions to all groups, but I am sure some will not even have recognised the similarities. The second session covered the North Atlantic. Like so many sessions here in Vienna this year the room where more than packed. The talks covered many different aspects, mainly on the thermodynamics. I left half-way, as I wanted to see some posters, which were mainly on statistics. After lunch I enjoyed the medal lecture by Shaun Lovejoy, who gave an interesting overview of the different scaling mechanisms in the atmosphere and the competition between random and deterministic approaches. The rest of the day was again visiting posters, trying to make my way into sessions (and failing) and finally sitting in the back of a statistics session to relax a bit. Today I heard from several people that they got annoyed from the overfull rooms. You hear this complain every year at EGU, but it seems to get louder at the 2019 edition. Or maybe, the sessions I visit (and those of the people I talk to) just got a bit more popular this year compared to the years before. A new year has started and in the recent month three new papers have been published, which have my name in the author list. In all three cases my contributions were more in the sense of statistical assistance, so I will just briefly introduce the topics. This paper predicts ocean surface waves on the seasonal scale. It uses enhanced prediction of the NAO with the sub-sampling algorithm to generate prediction skill for wave height in the North Atlantic. As the prediction enhances not only wind waves, but also the swell it is a consistent prediction enhancement for the total wave height. The second paper investigates the predictability of European summer climate by a physics-based sub-sampling. It uses for this a connection from tropical Atlantic SST anomalies over a wave train in the upper troposphere to the second mode of North Atlantic surface pressure. Unlike European winter’s, the second mode is as important as the first mode for European summer climate. As a consequence the predictability of surface temperature and other atmospheric variables over Europe are enhanced. This study uses a global model to show that the strength of the subpolar gyre (SPG) has a profound influence on North Sea water properties. Up to now regional models showed that most of the modulation happens due to Atmospheric influence. The modulations by the SPG happen on a decadal scale and can be followed on their way from the Atlantic to the North Sea.